← Why Take 1 Parking Space, When You Can Have 3? 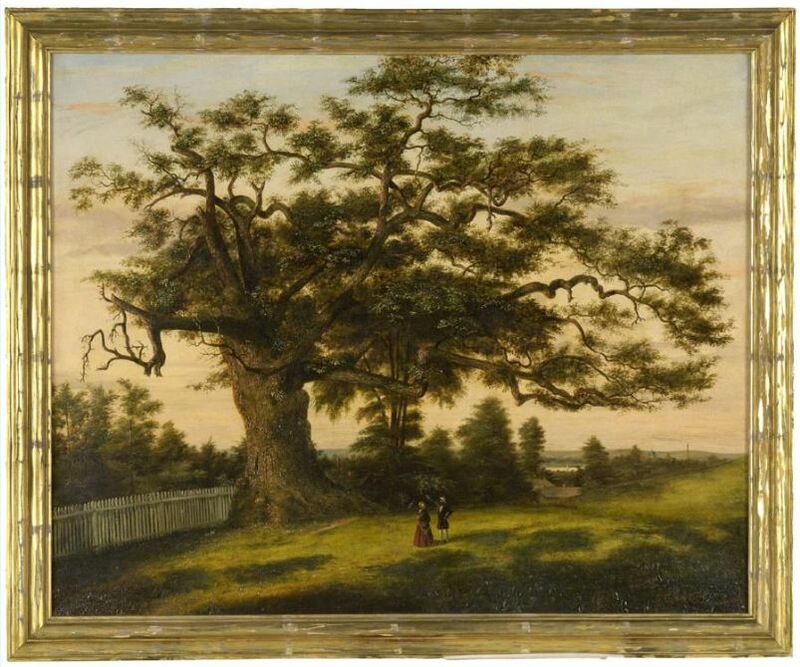 If you’re new to Connecticut, you may not know about our charter oak. They don’t teach state history in school — I don’t think so, anyway — and most of the state quarters that were minted nearly 20 years ago are out of circulation. But longtime residents know the charter oak. And one of its descendants may still live in Westport. The story involves a large white oak tree that dates back to the 12th or 13th century. Apparently our royal charter — given by King Charles in 1662, to the Connecticut colony — was hidden in a hollow in 1687, to prevent the governor-general from revoking it. The tree was destroyed in 1856, during a strong storm. But its legend remains. So, supposedly, do many of its seedlings. Lodge — a former governor of Connecticut and ambassador to Spain, and future ambassador to Argentina and Switzerland — lived in Westport. Minutes of a November 20, 1965 meeting show that a seedling was intended to be donated to Staples High School in the spring. Legend has it that the seedling was planted in the school courtyard on North Avenue. No one today knows authoritatively if that was done, or exactly where. If it ever existed, it was bulldozed away during construction of the new building more than a decade ago. Discussion then turned to the erection of a plaque, commemorating the gift to the town by Lodge. “It was agreed that watering and care after the planting should be delegated to a Town employee who would be responsible for its care,” meeting notes read. Arbor Day in April was suggested as a good time for the planting, and that school children should be involved. The committee then went outdoors to study possible locations. They agreed to store the 2 seedling oaks in the “cold barn cellar” of Parsell’s Nursery. Garden center owner and civic volunteer Alan U. Parsell was a committee member. And that’s the last bit of information I dug up about Westport’s charter oak. This entry was posted in Downtown, History, Looking back, Organizations, People, Staples HS and tagged Alan U. Parsell, Connecticut charter oak, Jesup Green, Parsell's Garden Mart. Bookmark the permalink. It would be a shame if state history isn’t taught in the schools. There is a lot of stuff to make you stop and think. The blue laws and the obligation to banish Quakers. The bishops and the creation of Connecticut because someone thought the Massachusetts puritans too liberal. Why Connecticut didn’t need a constitution for almost 50 years after the declaration of independence. And of course the Charter Oak. When doing research on the Alan Parsell family (in hopes of saving the historic barn – now destroyed – that once belonged to them at Geiger’s Garden Center), I came upon several newspaper articles about Westport’s Charter Oak seedlings. A Bridgeport Post article published Apr 14, 1966 shows a photo of 1st Selectman Herbert Baldwin, former Governor John Davis Lodge, and Alan Parsell at a ceremony in celebration of Arbor Day at Jesup Green. Herb Baldwin is pictured holding a shovel and they are planting a Charter Oak seedling. Governor Lodge was the principal speaker at the ceremony. It was attended by 100 people, and it was his seedling that was planted at Jesup Green. The Kimball seedling was due to be planted at Staples H.S. in the upcoming weeks. Charter Oak seedlings had been presented to delegates to the Constitutional Convention in the fall of 1965. Westport was represented at that Convention by Mr. Lodge and Penn Kimball (a Westport educator and author). A photo of the planting of the Kimball seedling at Staples H.S. appeared in the Bpt Telegram on Apr 30, 1966. However, the location can’t be determined by the photo. Many years later, an article in the Westport Minuteman dated Nov 22, 1995 explored the saga of Westport’s Charter Oaks. It claimed that Kimball’s oak was planted in “an open courtyard at the school.” Supposedly, a stone marker bearing an inscription was placed next to the tree. When Staples was remodeled in the 1970s, the courtyard was enclosed and the tree with its marker disappeared. Rumor had it that the tree had been damaged by a vehicle. However, when Penn Kimball visited Staples after the reconstruction, he noticed a white oak growing near the Auditorium. Kimball wondered whether the courtyard tree had been transplanted to the Auditorium location because its age was similar to the original. No one was able to solve the mystery. The same Minuteman article explored the fate of the Lodge Charter Oak. At that time, the exact location of the original Charter Oak seedling planted at Jesup Green was not certain. Former 1st Selectwoman Jackie Heneage thought that it was the oak that stood on the Green just behind what was then Fine Arts III. However, this tree was a pin oak, not a white oak. Penn Kimball was interviewed about this discrepancy. He reported that he’d given his seedling to Alan Parsell for overwintering until it could be planted in spring of 1966. Kimball didn’t know how Lodge’s tree was cared for during that same winter. However, Kimball said that Parsell had told him that the Lodge tree had died after it was planted so Parsell replaced it with another tree. Kimball joked by saying that he could imagine Parsell digging up the dead Lodge oak in the middle of the night and replacing it with another oak, but mistakenly replacing it with a pin oak. Another Bpt Post article published in 1966 listed the members of the committee that was charged with arranging for the above planting ceremonies. One of the committee members was Theodore Diamond who was Chair of the Parks & Recreation Committee at the time. I suspect that this is the same Ted Diamond who is alive and well and still living in Westport. If any 06880 readers are friends of the Diamonds, it might be worth reaching out to him to see what he might remember. 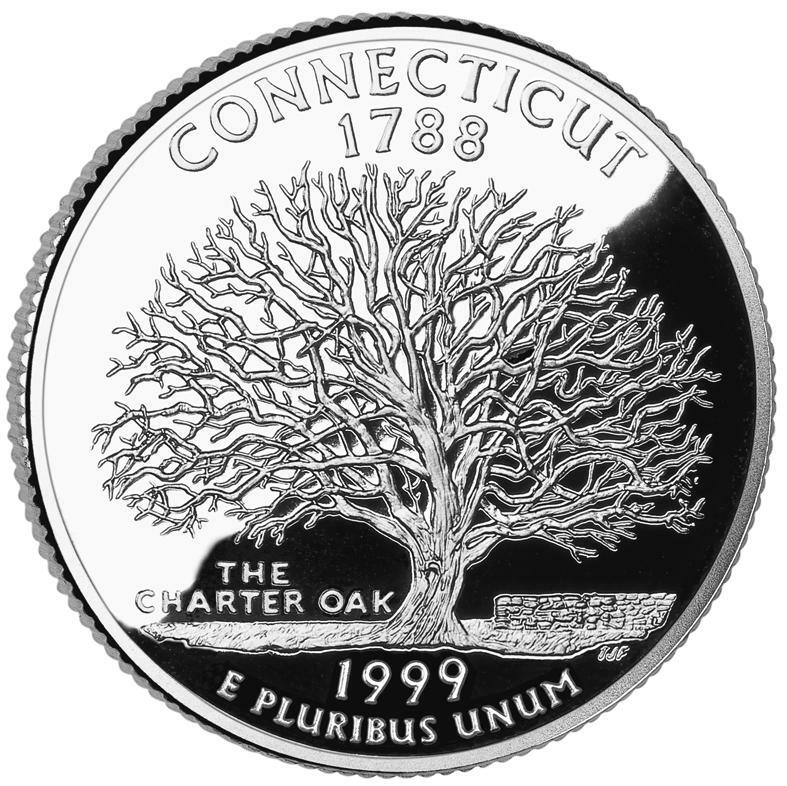 In 1976, the State of CT offered each CT town a seedling descended from the original Charter Oak in commemoration of the bicentennial. I didn’t look into whether Westport received one. Wow. Thanks Wendy. This is illuminating. And slightly depressing. I just walked though Jesup Green earlier today; like most of our parks, strewn with litter and looking pretty much like nobody cares. I worked on John Lodge’s property. It was on the river on Easton Road near Bayberry. Sad to see it go. Bedford Elementary (where I attended grades 2-6 between 1966-72) taught State History. (But as I explained in an earlier post re. the small cottage on Main St. where our young progressive teacher lived: that school retained some curriculum from the 1920s along w/ wooden desks w/ inkwells – so that may have been an anomaly even then). We took a field trip to Hartford to see the Charter Oak remnants. (Either a stump or parcel of land on which it stood?). There was a decidedly Connecticut & New England bias to our history lessons. “The Red Coats / Red Coat” vs. ‘The English / English’ etc. I now have a certain wistful nostalgia about hearing ‘Red Coat’ used as a descriptive adjective by local elders then. I find it really endearingly funny. Hahaha. I’ve never heard that – but I just looked it up and you might be pleased to know it has it’s own rather lengthy Wikipedia page… w/ some very funny & interesting examples from almost every sphere – literature (1993 Arthur Miller play) – name of a sports team – history (frightened locals hiding in swamps). I’m still not sure if I understand it’s meaning though. (What w/ the myriad examples given). Plus I thought we had marshes hear vs. swamps! A young Englishman was once explaining the word ‘Yankee’ to me – that it was “British for the word ‘American’.” I listened patiently then told him that in The States it means someone from New England & is thought to have come from an early Native American mispronunciation of the word for ‘English’ in French or Dutch (from early Dutch settlers here). He looked quite stunned honestly! He’d been correcting me on it’s proper usage. Thanks for posting this new phrase! Apparently it’s an insult – so I’ll try not to use it. To a non-American, a Yankee is an American. To a Vermonter, a Yankee is someone who eats pie for breakfast. The term Yankee is also thought to come from the Dutch “Jan Kees”, a sort of generic name for all Englishmen.